Love to attend live sporting events but hate the hassle of organising your trip? Thomas Cook Sport is here to help! With Thomas Cook Sport voucher codes you can get great deals on tickets and travel to some of the world's top sporting fixtures. So whether you want to plan a day trip to see your favourite Premiership team or a big adventure to the Monaco Gran Prix, a Thomas Cook Sport discount code will help you save the pennies. Part of Thomas Cook Group Plc, one of the most famous and trusted names in travel, Thomas Cook Sport is Europe's leading professional sports team and supporter travel company. As well as handling the day to day travel of players, coaching teams and sponsors of several major professional sporting teams, Thomas Cook Sport also provides a range of excellent travel packages for all their supporters wishing to see them in action around the world. Thomas Cook Sport has a wide selection of sporting holidays for customers to choose from. One of the most popular options is their dedicated 'Match Breaks' – holidays that offer fans the chance to watch matches between leading Premiership teams. The company will take care of all the arrangements, booking you an official match ticket along with comfortable overnight accommodation in a choice of hotels. You'll also receive plenty of great extras, such as a match day programme, stadium tour and visit to the Club Museum. And because Thomas Cook Sport operate the official Match Breaks for all their partnered clubs, you'll know you're getting the very best experience that money can buy. Want to travel to a foreign country to take in a major sporting event? Whether you want to watch Monaco's famous Grand Prix, follow the England cricket team around the tropical West Indies or see football teams play matches across Europe, Thomas Cook Sport can arrange the perfect travel package for you. They'll take all of the guesswork out of buying tickets and booking travel to international events, arranging all the details on your behalf. From budget-friendly breaks in comfortable hotels to full VIP hospitality packages, they've got something to suit every budget and taste – so everyone can afford to enjoy the thrill of seeing their favourite team play in some of the top sporting locations around the world. Want to book your sporting holiday with Thomas Cook Sport? With Thomas Cook Sport voucher codes you can make big savings on a wide range of breaks and holidays throughout the UK and the rest of the world. Whether it's a trip with all your friends to see your home team or the adventure of a lifetime to the other side of the world, a Thomas Cook Sport voucher code is a great way to save the pennies. Official supplier of Match Breaks for several leading Premiership teams. Browse our website until you find a Thomas Cook Sport voucher that suits you, then navigate to their website to begin browsing. Click on a sport or team for more information on upcoming breaks. Choose a break and click 'Book now'. Enter your room requirements and click 'View availability'. Choose a hotel and click 'Select package'. Enter your Thomas Cook Sport voucher codes in the box provided and click 'Apply voucher'. If you've enjoyed shopping for sporting breaks with Thomas Cook Sport, you might like to check out more great deals on amazing accommodation around the world with Hotels.com or Booking.com. Or, if those aren't right for you, you'll find more stores to browse in our Travel section. 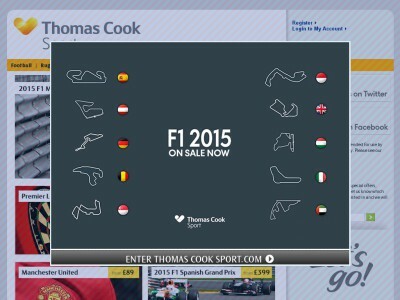 Enter your Thomas Cook Sport discount codes in the box provided and click 'Apply voucher'. Enter your passenger details and click 'Proceed securely'. Your travel documents will be posted to the address supplied when booking 7-10 days prior to your departure. Need to contact the team at Thomas Cook Sport? Whether you have a question about your booking, want to know more about a specific holiday or break or simply want to find out how you could make big savings with a Thomas Cook Sport promo code, you can contact the Customer Services department by accessing the online contact form here. Want to find out more about Thomas Cook Sport? Why not follow them across your favourite social media networks? You'll find fun sporting games and competitions, announcements about upcoming trips, promotions and more. You can also use these pages to find out more about saving money with a Thomas Cook Sport discount code. Don’t forget to check them regularly, as you can never be sure when a free Thomas Cook Sport voucher might be waiting for you! Buy now online at www.thomascooksport.com. I wanted to treat my friend to a trip to see his favourite football team play abroad, but organising it myself was complicated and expensive. Then I discovered Thomas Cook Sport voucher codes! With a Thomas Cook Sport voucher code you can enjoy fantastic savings on professionally-planned package holidays taking in some of the world's top sporting events at thomascooksport.com. I used my Thomas Cook Sport discount code to book us a holiday in Spain including top tickets to see Liverpool play Barcelona. Plan your sporting holiday with a Thomas Cook promo code!